Secrets have a tendency to always come out of darkness. Sometimes, it takes days, years or decades. The more well-kept ones might last for centuries. Still, if we did not learn about one particular secret, we would probably not have the film “Victoria and Abdul” by Stephen Frears, telling us about true friendship that cares not about age, religion and can last as long as the life itself. This is truly an inspiring, beautiful and uplifting story that may not be one hundred percent accurate – and quite frankly, it does not have to be – as long as it succeeds in delivering its message to the viewer. What is required from us, as viewers, is to have an open mind and letting the story transport us into the time when this charming story took place. 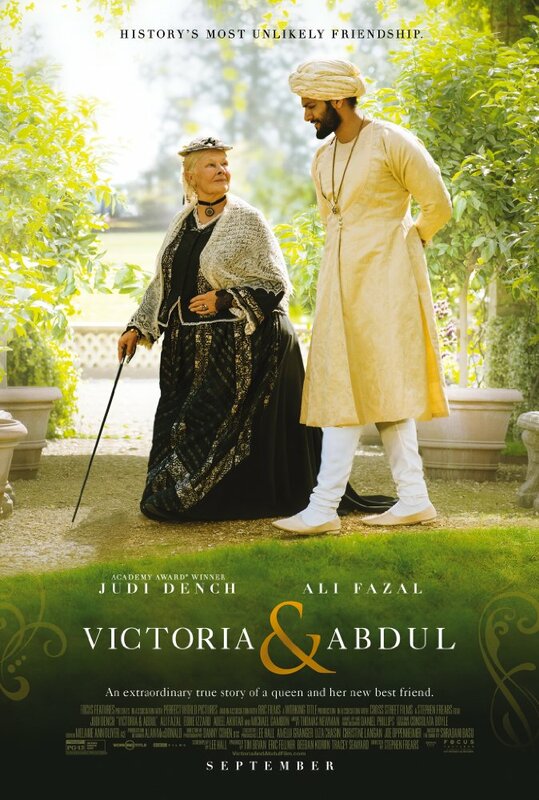 Set in 1887, an Indian functionary named Abdul Karim (Ali Fazal) is chosen to deliver a ceremonial coin to Queen Elizabeth (Judy Dench) on behalf of India. Interestingly, the young man is chosen for his height. Abdul travels with his friend Mohammed (Adeel Akhtar) all the way to England. They soon find themselves in Buckingham Palace where he is instructed to refrain from making an eye contact with the queen when presenting the coin. As soon as Karim sees her Majesty, he forgets of the warning and throws a quick glance at her. This one glance is to change the course of the history. It might be his bold behavior or his kind heart; his innocent look or the astonishing level of his naïveté that makes Queen Victoria notice this young man among others. He is real and not pretending to be someone else around her. He is gentle and caring. There is something about him so visibly attractive, that the Queen orders Karim to stay by her side from that moment on. Soon, the young man turns into her Munshi (a spiritual teacher), who introduces Victoria to Urdu, Koran and his rich culture. His honesty touches the Queen deeply, and eventually, she opens her heart for him. Something, nobody ever would’ve dared to ask from her – a true friendship. Soon, this can also turn into a huge scandal and the biggest embarrassment for Britain. But not for Queen Victoria. Stephen Frears is the director who brought to us such films as “Florence Foster Jenkins” starring Meryl Streep and Hugh Grant; “Philomena” with Judy Dench; “The Queen” with Helen Mirren, and the classic “Dangerous Liaisons” featuring the starry cast of Glenn Close, John Malkovich, and Michelle Pfeiffer. Now, we get another beautiful period drama from the director with elements of subtle comedy and intelligent lines. Dame Judy Dench once again makes a royal appearance – this time, as Queen Victoria. The screenplay written by Lee Hall is an adaptation of the book by Shrabani Basu. This skilfully told story of Victoria and Abdul once again reminds us of the reason why films like this will always have a special place in the viewers’ heart. In conclusion, “Victoria and Abdul” is full of drama. I can’t even start to describe all of them. The gently crafted scenes and intelligent humor will keep the viewer engaged throughout the film. As for the performance, it’s something you don’t have to worry about. The Master Dame Judy Dench shines as ever, and the rising Bollywood star Ali Fazal manages to hold the scenes with her on an impressive level. Something, I did not see coming. Apart from all the above mentioned, it is the concept of the film and the story itself that will keep you intrigued. It brings together two different cultures – reminding us how two cultures can coexist, prosper and blossom like a flower. Yet, will die if there is no sunshine. There is always an opportunity to learn something new from such stories and I believe they help us to become better persons because, at the end of the day, one can own the world, have the all the money possible, but it will still mean nothing if there is no true and unconditional friendship in one’s life.